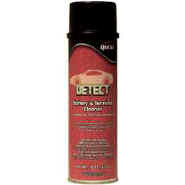 Detect Battery & Terminal Cleaner cleans and neutralizes acid on battery terminals and cables. Detect even changes colors so you know it's working. An enclosed color indicator detects acid leaks, too.